There’s a nice refinement to the iOS lock screen in the 5.1 update released today: now, your iPhone’s camera lurks just beneath the lock screen, and you can jump straight into it with an upward swipe. Previously, it was possible to toggle a button that appeared in the same position, and took you to the camera when tapped. 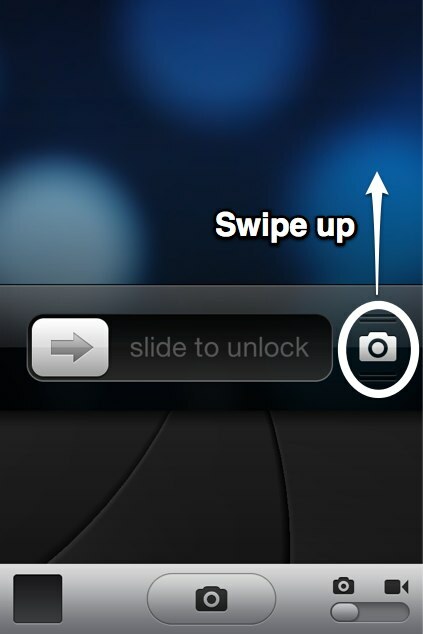 In iOS 5.1, that button becomes a handle for swiping, and seems to be permanently in place. UPDATE: Experimenting with this today, I discovered that if you swipe up to show the camera from the lock screen, you can swipe down again from the top of the screen to put the camera away and lock the phone again. The downwards swipe won’t show Notification Center.